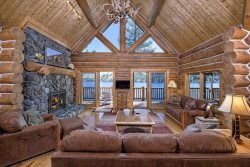 Custom built log home with large deck overlooking your private boat dock! Enjoy one of the many pubs, bistros, restaurants, while staying in Wallowa County. Arrowhead Chocolates is the result of a happy happenstance--the result of one of those ides that come up between several people who, at that moment the idea appears, all feel a thrill of excitement. Embers Brew House features the largest selection of microbrews in Oregon! Red Horse Coffee Traders was inspired through family, friendship, and a fierce determination to continue the dance. Come visit our own local microbrewery and have a taste of good pub fare and microbrews from this neck of the woods. Enjoy our outdoor seating among the aspens and play on the volleyball court. Vali`s Alpine Restaurant offers family style dining. Every dish is prepared from our family recipes. We have a deli case and on Saturday & Sunday mornings we offer homemade donuts and pastries. Little Bear Drive In is located in Wallowa. Brings back great memories of my childhood each time I stop in for a treat! Restaurant in Joseph, Oregon, that specializes in everything from sweets, to burgers, to steaks. Great food, great service! Open for breakfast and lunch, we serve good home & hearty cooked meals. If you are looking for an on-site personal cook to fix a buffet-style meal have a private party or activity, need concessions, appetizers or sack lunches, we can help! We will work with you on menus. Serving a wide variety of mexican foods and the best margaritas and sangria`s ever! Heavenly`s is the place to go. Try our burger or your missing out on a truly divine experience. We pride ourselves in made to order food. Check us out and now we have gourmet pizza. Business delivery. The Imnaha Store & Tavern built in 1904, serves hot meals & cold beer...and is the local grocery store. The store has bait & tackle for the fishermen out there. In the winter enjoy home cooked meals. For all your Mexican food cravings check out La Laguna. Our restaurants provides a wide range of authentic Mexican food available for lunch and dinner. Full service bar & vegetarian entrees. Drive thru espresso featuring coffees, mochas, ice coffees and blended drinks and 100% fruit smoothies. Home baked cookies, muffins & scones. And a smile with every order. Family owned & operated welcomes folks with friendly, good food, unique home cooking using as much locally produced farm fresh available. We also cater for weddings to special events and desserts. At the Outlaw authentic is something you`ll experience. It is also something you`ll taste. American favorites prepared and served with pride. It`s the way food was meant to be. Stop by Sugar Time Bakery in Enterprise to satisfy your morning or afternoon appetite. Breakfast items available daily include cinnamon rolls, orange rolls, sweet and savory scones and quiche! Popular Greek cups provide a gluten free choice for breakfast or a light lunch. The regulars; jacked-up brownies, chocolate chip brownies, berry bars, and lemon bars are perfect for your sweet-tooth. Cheesecakes and pies are available whole and by the slice. A variety of cupcakes and jumbo cookies round out the choices available at the counter. Eva`s custom cake creations are works of art! Offering a variety of unique flavors, she uses the very best quality ingredients. Everything is made from scratch; no commercially prepared mixes here. Special order a favorite flavor for your wedding, a birthday or celebratory event. First time buyers are usually more interested in the design but it`s the taste and texture that brings them back time and again. One of our very favorite places to get coffee when we are going thru Lostine! Loretta and Kasha go the extra mile to make sure every bit of everything is just awesome! We love them and know that you will too!